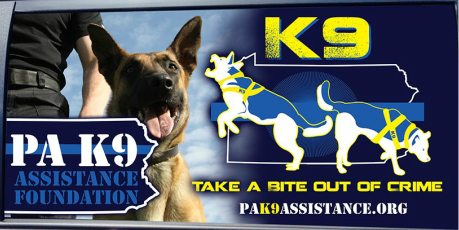 PA K9 Assistance Foundation is able to assist law enforcement K9 teams within the Commonwealth of Pennsylvania ONLY. This form is to be used by Law Enforcement K9 Handlers, Supervisors, and Administrators. If you are a citizen and inquiring about making a directed or general donation to a specific county or agency, or seeking information, please use the "Contact Us" form in the menu bar. PA K9 Assistance Foundation accepts applications continuously during the calendar year. Applications will be reviewed and a determination of eligibility will be made at least twice per calendar year. Approved applicants will be contacted as soon as possible for additional information and/or to arrange presentation or delivery of the donation. Delivery of donations will be anticipated by the months of June and December each calendar year unless advised otherwise. Please understand that PA K9 Assistance Foundation is only able to honor requests for assistance based upon available funding. Approved requests are generally honored in order of receipt with safety equipment being prioritized. Some applications may not be reviewed until the following cycle and some requests may not be able to be honored due to various reasons. Information requested in this form may be used for statistical purposes so that we may be able to continue helping other K9 teams obtain the equipment, supplies and services they need. PA K9 Assistance Foundation does not sell or otherwise provide personal information of the requesting person or agency to anyone. Personal information will remain confidential. If you have requested our assistance in the past 12 months and would like to know the status of your request please use the "Contact Us" form in the menu bar. Please complete as much information as possible. Categories with a "*" are mandatory. To be eligible, K9 team must be in training or in service. Please provide an email that you may be contacted through. Make sure to check your email preferences to allow emails to go to your inbox from "pak9assistance.org"
Supervisor of your K9 Unit preferably. If application pertains to multiple K9 Teams please list the information for additional teams in the last comment section at the bottom of this application. If your are not requesting assistance with obtaining equipment select "none". If the type of equipment is not listed, select "Other" and specify below. If you are not requesting assistance with obtaining supplies select "None". If supply is not listed select "other" and specify below. All requests are honored in order of receipt and available funding for that category. While this could be reason to deny your request, it is not always the case. PA K9 Assistance Foundation does work with other organizations to make sure that K9 teams within the Commonwealth of Pennsylvania are equipped and protected to the best of our ability. Believe it or not, not all departments will accept or approve donations!! Some equipment donations require acceptance/approval by the receiving department as it must be installed in an agency owned vehicle and/or require additional training. While promotion is not required to be eligible for a donation, PA K9 Assistance Foundation would be very grateful for any promotion via print, video or social media. Such a promotion has proven to be beneficial for both your unit/agency and our organization.